In the history of the Washington Capitals, there were two notable defensemen with the surname Green. Most younger or newer fans remember Mike Green, who played with the team from 2005-2015, but there was also another defenseman named Green who spent time with the Caps, Rick Green. 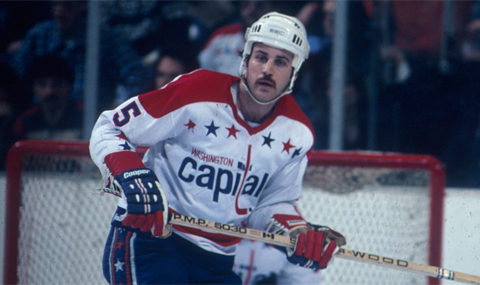 Richard Douglas “Rick” Green, born on February 20, 1956, in Belleville, Ontario, was chosen as the first overall pick by the Capitals in the 1976 NHL Entry Draft. He had a stellar junior hockey career with the London Knights of the Ontario Hockey League (OHL). In his last year of juniors, he won the OHA 1976 Max Kaminsky Trophy for Most Outstanding Defenseman, as selected by league general managers. He played six years for the Caps as a “stay-at-home” defenseman, playing in 377 games. During that time, he contributed 31 goals and 127 assists for 158 points. He set a team record (since broken) during the 1976-77 season with the most shots on goal in a game by a defenseman with nine. Green was dogged by injuries while with the Caps, which included: missing part of the 1976-77 season with a broken wrist; missing time in 1977-78 with a separated shoulder; missing part of the 1980-81 season with a broken hand suffered in November 1980, and missed several games in 1981-82 with a separated shoulder suffered in December 1981. During his tenure with the Caps, he represented Canada three times in the World Championships and was part of their Bronze Medal team in 1982. He ended up playing seven seasons with the Canadiens, with the high point of his career being in 1986, when the Habs beat the Calgary Flames in the Stanley Cup Finals. His defensive play was important to the Habs’ success under Coaches Jean Perron and Pat Burns. Green did not contribute as much on offense for the Habs, scoring 10 goals and 79 assists for them in 299 games during his seven-year tenure with the team. He spent his last two years in the NHL with the Detroit Red Wings and the New York Islanders before retiring in 1992. He played a grand total of 845 games in the NHL, scoring 43 goals, and adding 220 assists for 263 points. His post playing career included: a stint as an assistant coach with the New York Islanders for three years starting in the 1992-93 season; then serving as an assistant with the Los Angeles Kings from 1995-1999 until returning to Montreal. This entry was posted in History, News, Players, Profile and tagged Alumni Profile, Diane Doyle, Rick Green. Bookmark the permalink.